Man, I hate making mistakes. The only thing worse than making mistakes is making them in public, and the only thing worse than that is finding them in published papers when it’s too late to do anything about them. About the only consolation left–if you’re lucky–is getting to be the one to rat yourself out (we have to do this a lot). So here goes. In our figure 4 (from Taylor et al. 2009) we showed the skulls of three sauropodomorphs, Massospondylus, Camarasaurus, and Diplodocus, posed with horizontal semicircular canals (HSCCs) level, angled 30 degrees above horizontal, and angled 20 degrees below horizontal, as it is written (by Duijm 1951). We also showed the angle of the occipital condyle when the HSCCs are level; if the craniocervical joint was in osteologically neutral pose (ONP), that line would indicate the angle of the anterior cervicals. Trouble is, we put the neck lines for Diplodocus and Camarasaurus in the wrong places. As any idiot can see from Sereno et al. (2008: fig 1), the brain, brainstem, and occipital condyle form a line that runs from roughly the upper part of the orbit (in lateral see-through view) out the back of the head. Now if you look at our fig. 4 you’ll see that the ONP lines for Camarasaurus and Diplodocus are much too inclined, so that if the brain was in line with the anterior neck–which it should be, in ONP–it would be sticking out the back of the head. If that doesn’t make sense, just look at the above illustration, imagine the brain and spinal cord in a straight line parallel to the black neck line but also dorsal to it, and you’ll see that the brain would be outside the skull. Those incorrect neck lines don’t represent impossible postures, but they don’t represent ONP, either. Here’s a corrected up version of the figure to show what I mean. The black lines are still the ONP neck lines, and now I’ve put in shadowy necks at +30 and -20 to go with the shadowy heads. The 50 degree spans marked out by the shadowy necks are the ranges within which the neck could articulate in ONP with skulls stuck in the 50-degree “Duijm window”. Caution: it is very easy to misread the shadowy necks as showing a range of movement within an individual; in fact, the neck lines are ‘anchored’ to the skulls in ONP as the skulls rotate through the 50 degrees allowed by the HSCCs. They are not individual movement but the possible range of taxonomic variation in HSCC orientation according to Duijm (1951). Nigersaurus, buddy, why so down? In this version I’ve gone one step farther and included Nigersaurus (modified from Sereno et al. (2008: fig 1). Nigersaurus differs from Diplodocus in the angle of the face from the HSCCs and occipital condyle, not in the angle between the HSCCs and the occipital condyle, which is remarkably similar in Camarasaurus, Diplodocus, and Nigersaurus. This suggests that Nigersaurus held its head differently than other sauropods, but not necessarily its neck. Keep in mind, though, that the difference in facial angle between Diplodocus and Nigersaurus is less than 50 degrees, and that some of the head postures in the respective Duijm windows of the two taxa are identical. So we can’t say for certain that Nigersaurus held its head differently than Diplodocus; it is possible that they held their heads at the same angle and that Nigersaurus just carried its HSCCs at a different angle. If that were the case, the neck of Nigersaurus would have been more inclined than that of Diplodocus. 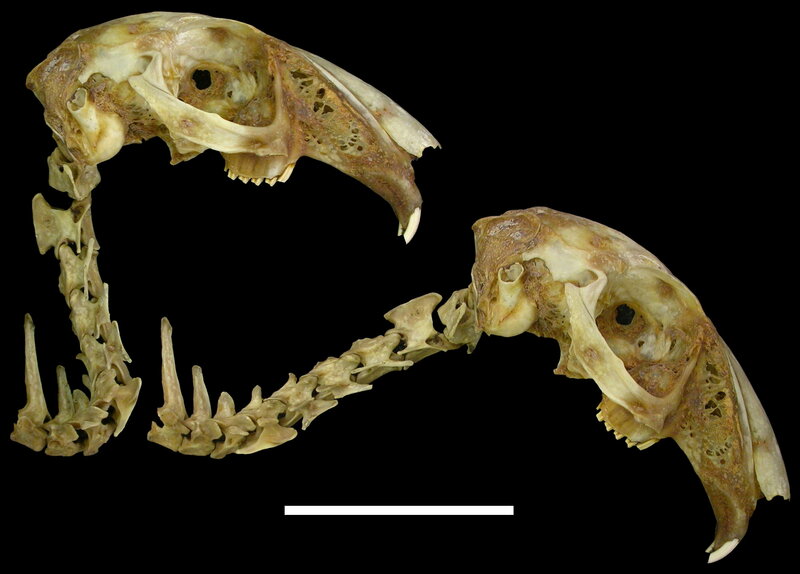 I’m not arguing that that’s likely–it seems perfectly plausible that the two taxa might have held their necks similarly and their heads differently, as suggested above–I’m just pointing out the very wide range of possibilities allowed by the data. To reiterate one of the points of the paper, HSCCs aren’t useless for determining habitual head posture, they just can’t narrow things down very far on their own. Also note that some of the neck postures allowed by the Duijm window have the anterior cervicals running down, below horizontal, not up. And many of the allowed neck postures for the neosauropods are close to horizontal. So, we were wrong and HSCCs + occipital condyles show that most sauropods held their necks close to level and not strongly elevated after all, right? Onward and Upward, or Down in Flames? Not so fast. Remember that all of the neck lines in the above figures show the angle of the anterior neck if the neck was in ONP with the skull. But Vidal et al. (1986) found that the skull is habitually flexed on the neck, even in lizards, and we have since verified this for salamanders, turtles, and more. And sometimes the flexion is dramatic. Our figure 1 (from Taylor et al. 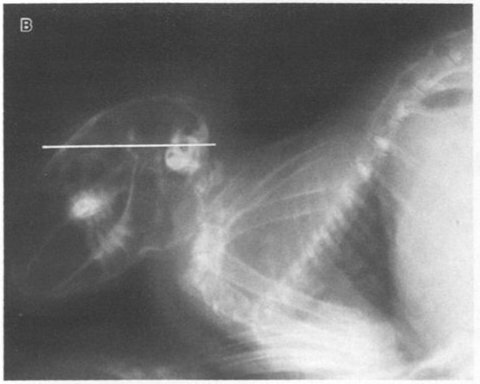 2009) shows the cranium, cervicals, and first few dorsals from a hare in ONP and in the posture shown by Vidal et al. (1986: fig. 4b). The difference between the anteriorly-directed ONP pose and the backward-leaning Vidal-compliant pose is striking. I measured the angle between the cervical column and the maxillary toothrow to be ~110 degrees in the ONP pose and ~70 degrees in the Vidal-compliant pose (try it yourself with Paint or Photoshop, or download some free image manipulation software). That means the head is flexed on the neck by 40 degrees! That is a big angle. If sauropods did the same, you could take the neck lines shown above and crank them down by 40 degrees (remember that the heads are “fixed” into the 50-degree Duijm windows allowed by the HSCCs), which would make Mike’s elevated Diplodocus look not just achievable, but perhaps even conservative. Where does all that leave us? In sauropods for which HSCC orientation is known, putting the HSCCs level the anterior neck is still inclined, and even with the HSCCs angled 20 degrees down the ONP neck would only be slightly below horizontal, and if the head was Vidal-compliant (strongly flexed on the neck), the neck would have to be above horizontal. So heads still tell us about necks, and in particular they tell us that the necks angled up. Our neck lines for Camarasaurus and Diplodocus are not correct for ONP, but probably represent attainable postures. My first head ‘n necks post has the angles too exaggeraged for ONP, too, but again all of those poses are not just possible but likely if the head was flexed on the neck. We owe mad props to Brian Engh, a.k.a. The Historian, who burst on the paleo-rap scene with a rap video about crocodilian predation and almost certainly the first ever kung-fu rap video to name-check titanosaurs. Brian stumbled across Mike’s extra goodies page for the new paper about week before the paper was due out, and kindly suppressed the information until after D-Day. You can and should download his entire album, Earth Beasts Awaken (open access, yo), and kick it old school. Congratulations to Francisco “Paco” Gasco, who just got funding for a PhD to do a complete morphological and paleobiological workup on the giant Spanish sauropod Turiasaurus. You’ll be hearing more about Paco in the not-too-distant future, we promise. Finally, here’s that video of an elephant grabbing an ostrich by the neck that you ordered. This brings us to the end of ten solid days of new posts, which is a new record for us and one not likely to be broken for a long time, if ever. We never planned to do all this; in the beginning we each were going to contribute one post and that would have been that. But we kept finding things that we felt needed to be discussed. As all of us have been saying in every available medium, this is not the end of anything. The sauropod neck posture debate is not over; in a few years we may look back and see that in 2009 we were still stumbling to the real starting line. We don’t think this stuff is unimportant or unknowable, and we’re going to keep working on it, and we hope lots of others do as well. That video is disturbing. How did the situation end…? Agreed, that HSCC’s likely aren’t the be all and end all of head posture. The head has different postures to do lots of different things, and there are most certainly comflicting demands on the inner ear alignment. The problem with your “analysis” of HSCC’s is that you’re lumping all sauropodmorphs all together. Frankly, and you should have pointed out, the *alert* postures (note I said ALERT postures) of Camarasaurus and Massospondylus, as figured, hugely support your argument of neck posture. The problem is trying to wrench Diplodocids to fit your paradigm…. which not only puts them at odds with other sauropods, it puts them at odds with *every other vertebrate*: To get most of these Diplodocids with a level head, their HSCC’s need to be at about 90 degree’s (Nigersaurus is literally 90 degrees from the long axis of the skull)…. which obviously is three times the maximum (and an outlier in those data, most likely) from the paper that *you* cited. Your arguments for neck posture most likely need to focus on the vertebrae themselves. 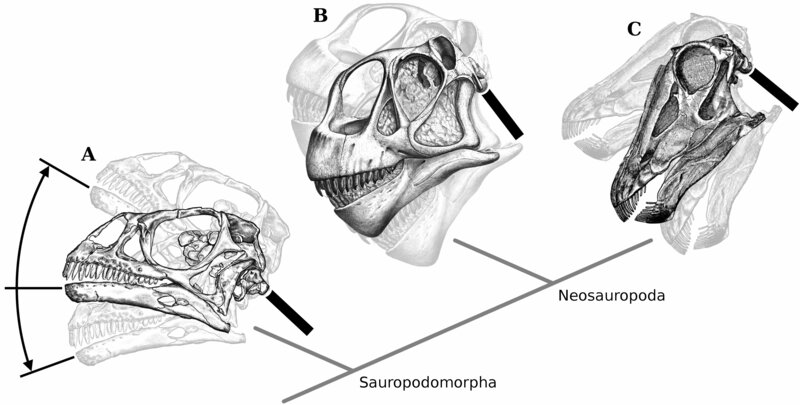 Can you resolve morphological differences in vetebral morphology in Camarasaurus and Brachiosaurus and Diplodocids?…. Especially in regards to the “neutral alignment”? That would be nice to see. David wrote: That video is disturbing. How did the situation end…? Wish I knew! I assume the elephant eventually released the ostrich; I think if an elephant had murdered an ostrich in front of witnesses, the story would have become known. Ryan wrote: The problem with your “analysis” of HSCC’s is that you’re lumping all sauropodmorphs all together. Well, on the one hand, it’s worse: I’m lumping all amniotes together, because I’m assuming that the variation in HSCC angle we see in mammals and birds applied to sauropods (EPB). Until we have evidence that it didn’t, I don’t know what else to do. But I don’t see how I’m lumping all sauropodomorphs together any more than, say, Sereno et al. (2008) did. FWIW, I don’t think any of us are “lumping” everyone together; surely placing the skulls and postures in a phylogenetic framework shows that we all recognize that evolution has occurred? I’m sorry, I’m not following you here. 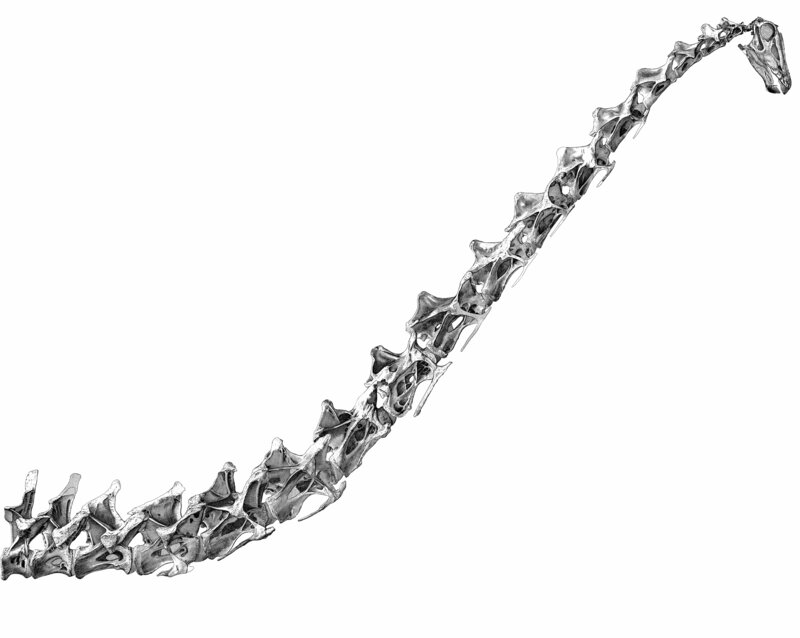 The differences between HSCC angles and neck angles in the diplodocids and Camarasaurus are negligible; it’s Massospondylus that is the odd one out. I may just be missing your point here; please feel free to clarify. To get most of these Diplodocids with a level head, their HSCC’s need to be at about 90 degree’s (Nigersaurus is literally 90 degrees from the long axis of the skull)…. which obviously is three times the maximum (and an outlier in those data, most likely) from the paper that *you* cited. Sorry, I’m still lost. I’m not trying to get the heads of the diplodocids to be level, and I can’t imagine a justification for doing so. I’m just putting their HSCCs within the Duijm window and seeing what effect that has on neck angle. Is it possible that you are confusing the angle of the long axis of the head with the angle of the HSCCs? I’m not trying to obtuse, I’m just not following your argument. Again, I’d be grateful for clarification. Your arguments for neck posture most likely need to focus on the vertebrae themselves. 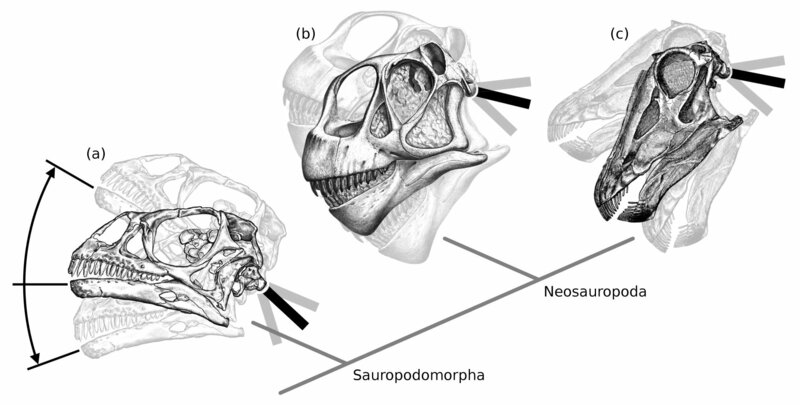 Can you resolve morphological differences in vetebral morphology in Camarasaurus and Brachiosaurus and Diplodocids?…. Especially in regards to the “neutral alignment”? That would be nice to see. I agree, that would be great to see. AFAIK, no one has done Camarasaurus in the peer-reviewed literature, although Scott Hartman is working on the problem and presented some results in an SVP poster a couple of years ago. The ONP for Brachiosaurus cannot be determined because the zygs are not preserved posterior to the middle cervicals. As for the criticism that our arguments for neck posture need to focus on vertebral morphology, surely it is evident from this post that I am trying to find out what heads tell us about necks apart from vertebral morphology. That doesn’t mean that I’m not interested in vertebral morphology; obviously if the data from the head would force the neck into a pose that the vertebrae absolutely cannot achieve, then something is wrong; either the range of HSCC angles in sauropods was greater than we think (i.e., the “Duijm window” is wider than the 50 degrees that Duijm found), or the vertebral column was more flexible that we think. With regards to the latter, we noted in the paper that when we manipulated dry skeletons we could not achieve the vertical and past-vertical poses illustrated by Vidal et al. (1986) without disarticulating the vertebrae to some extent. We therefore infer that soft tissues expand the ROM one would infer from osteology alone, rather than constricting it. Many people have responded to our paper and blog posts by saying that we need to look at vertebral morphology. We strongly agree that vertebral morphology is important (otherwise we wouldn’t have set up this blog). But, as we’ve said before, we aren’t trying to solve all the problems in sauropod neck posture in one go. The finding that extant tetrapods do not hold their necks in ONP is one new angle, and the range of variation in HSCC angles is another. And despite all the rest of the ink spilled here and elsewhere, the paper is really just about establishing those facts and working through their implications. So if you’re using HSCC’s at all in your arguement, the bottom line is that you simply *have* to treat diplodocids as a separate entity. They ARE unique, both within sauropodmorpha, and within vertebrata. Trust me. Actually, just took a better look at your revised figs… and you’re being a little generous with those neck/spinal angles. Based on actual data, if you were to section those critters sagitally, and look at how the spinal cord slides out of the foramen magnum, you should make your “bold” lines more or less horizontal and go from there. (Yes…. Nigersaurus is that fugged up!) As it is, you’re pinching ventral vasculature within the spinal cord on the rear of the occipital condyle. Hi Ryan, thanks for the updates. Diplodocids (we’ve sampled more than I can count with my body) are completely unique other from sauropods with their semicircular canal orientation…. and data from other 100’s of other archosaur taxa (and gawd only knows how many other vertebrates) show the diplodocid condition to be highly derived. No one else does this. No one. I think we may have been talking past each other. I’ve been talking about the orientation of the HSCCs relative to the angle of the brainstem and occipital condyle, where the diplodocids looks about the same as Camarasaurus. I think you’re talking about the orientation of the HSCCs relative to the long axis of the skull–please correct me if I’m wrong–in which case the dipldocids are more rotated than Massospondylus or Camarasaurus. I’m not sure what you mean, though, when you say that “no one else” does this; some birds have the face rotated very far from the HSCCs also. Or am I misunderstanding you again. It may well be, but our argument is not statistical. Our argument is, “Here’s the range of variation we see in extant taxa, and we haven’t figured out a way to narrow it down for extinct taxa”. So we might be able to say with 95% confidence (based on Duijm’s data or a larger combined dataset) that a given extinct taxon fell within a narrower window, but we don’t know that the extinct taxon wasn’t an outlier as well. Or is there some way to tell? I’m sorry, I’m still not following you. Are you talking about HSCC angle with respect to brain angle, in which case diplodocids seem to be very similar to Camarasaurus, or with respect to facial angle, in which case they seem to be very similar to some extant birds, or with respect to something else entirely? I’m genuinely curious, and grateful for your efforts to explain this. Diplodocids (we’ve sampled more than I can count with my body) are completely unique other from sauropods with their semicircular canal orientation…. I, too, think you’re talking about the long axis of the skull. What you seem to have overlooked is that the long axis of the skull is not a straight line in these animals, it has a kink in it (a 90° angle in Nigersaurus). What all diplodocoids, and Nigersaurus in the extreme, have done is to keep the braincase as it was and rotate the face around it. The face points downward (vertically so in Nigersaurus), while the braincase, including the semicircular canals, is still horizontal. We’re definitely not on the same page… not sure how that happened. Waxy build up in me ears, I think. Though, I think we’re saying something similar…. just from different angles (no pun intended). I’m talking about the skull as a whole… braincase, condyle, “brain”, all inclusive. I got the impression from the paper, and the whole skull figs, that we we’re using the seemingly “downturned” condyle of Diplodocus to argue that, plus 30 degrees gives us a nice place to put a more vertical neck. Of course, as David correctly noted in a pleasant bold face (again, no pun intended), that the braincase is basically Joe Sauropod, and the face seems rotated downwards…. I guess the confusion on my end comes from still being amazed at how funky some of these guys are, and if anyone could physically break the rules here, it would be a diplodocid. Plus, I confuse easily. David, that video also appears on Youtube at http://www.youtube.com/watch?v=MWcI7nLTj_c where is carries the comment “Everything goes well with the ostrich after the struggling.” I don’t know how authoritative you’d consider that, but it’s something. Oh dear, I was only googling for a picture of a giraffe to illustrate a poem I’m sharing with my class of 5 year olds tomorrow. And through a bizarre set of links I ended up here. And have spent an hour reading. It’s 20 years since I took my degree in geology – and I have been dredging old paleo orientated brain cells into gear. It was all facinating – thank you. Thank you, sincerely. Feedback like this is balm for the soul. It’s traditionally said that the braincase of diplodocids is rotated backwards; but given that we’re fixing the attitude of the head by placing the HSSC near horizontal (or at least within the Duijm Window — great phrase by the way), David’s reformulation is a much better way to look at this: “What diplodocids have done is to keep the braincase as it was and rotate the face around it”. So, Ryan, the very tentative conclusions that we’ve drawn above the angle of the anterior necks of these sauropodomorphs are ENTIRELY unrelated to the orientation of the face, and is deduced wholly from the angle between the orientation of the HSSC and the brain-stem. That we also included the skulls in the figure seems to have caused some confusion, but that really was not the main point of the figure, as the accompanying text makes clear. Finally (for now), you’ve suggested a couple of times that the habitual thirty-degree upward inclination of the HSCC in Duijm’s data-set might be an irrelevant outlier. Sadly, Duijm’s actual data is not available: all we have to go on is Fig. 7A of his 1951 paper, which shows the observed orientations for 33 birds grapically. However, it’s apparent from that graph that two of the sampled species were observed to hold their HSSC in the +30 attitude; so, no, I don’t think this is a discardable outlier. Hope that clears things up more than it muddies them! Mike, I don’t know why you used the skulls in the paper either. If you’re using relatively small angles, you should have looked at the braincase, and you should have cited papers on the endocasts, which are indeed published. Even a modern high tech treatment of sauropod endocasts is recently out there (albeit in an obscure, admittedly expensive book)…. instead of simply cribbing figures incorrectly (Which is fascinating that you precisely cribbed the entire Sereno figure and did not cite the paper in the caption!). Then we could see the angle of what the neck actually had to work with, which is still quite incorrect even as revised on Matt’s blog. Sweet fudge. My jump to head posture (instead of “brain stem”) in my previous comments stems partially from seeing the figure, but also that you snagged Fiorillo’s observation of of the 90 degree downturn of the occiput as evidence (a la Mammalia) for a more elevated neck. Frankly guys, this stuff is all about probability in the end. You’re framing your HSCC argument on some highly derived modern species, without looking at any of this stuff in a proper phylogenetic framework…. and then using the paucity of data in the studies you selected to say what you want. In effect setting up a straw man, and then knocking him down. The methodology is akin to me getting a fish and a lizard, seeing that they both have scales, putting them on a basic cladogram, and then saying all vertebrates must have scales (although, I’m ascribing the primitive condition, you the derived). Of course, if I look elsewhere, I’ll see that’s clearly not the case. This is science. You need to frame your question in a phylogenetic sense, optimize the cladogram based on osteological evidence, and then fill in the gaps. There are helpful people out there (that I know quite well) who I’m sure would have loved (and still would love) to share data to help resolve these questions. I’ll give your “Duijm Window” all the space in the world (though, funny you use “window”, as window is suggestive of “window to say what you please”–and you’re only using the extreme range of it only when it helps your argument). The problem is that most vertebrates couldn’t take advantage of it. Again, most vertebrates would be in extreme pain, even given a low dosage of “Duijm Window” (and even the proper T-rex and Triceratops mounts, as pointed out on Matt’s blog would be hating life). It’s true that we can’t blow a dog whistle and see what many of these extinct animals were doing when startled… but since all basal theropods (immediate outgroup of Sauropodamorpha), have their heads horizontal when the HSCC’s are aligned to the horizontal, it’s a safe bet that they didn’t go all “Duijm Window” when startled. Most animals tend not to auto-induce whiplash. Thus, phylogenetically, the “Duijm Window” falls apart within Sauropsida, and if it did exist in Sauropodamorpha, it would be 100% apomorphic and untestable… and at odds with the evidence. The birds and primates (especially us crazy hominids) actually do have a convenient, ventrally placed foramen magnum, which they fully take advantage of by putting their spinal cord through. Thus, the rear end of the brain in birds and mammals is rotated downwards relative to the long axis of the cerebrum. It’s possible that some of this is driven by the stupidly large cerebrum in birds and mammals… I dunno… I don’t want to armchair. If you actually looked at the “brain stem” in sauropods (or I guess the whole endocast instead of just the brain stem), you would see that what we know about the sauropod brain is that it’s your basic reptilian (i.e. primitive) brain. You could have got this out of Hopson’s work (which you surprisingly did not cite!). Why didn’t you look at critters with similar braincase/brain stem/endocast/occiput morphology?? In sauropsida, the “reptilian” gross brain morphology can be found in all squamates, crocs and gators, nearly every extinct archosaur, most Dinosauria, like 90% of Saurischia…. only critters deviating from this in Saurischia is birds. Look, I really, really like the work you’re doing with the neck itself, and refuting the ONP. I think it’s neat stuff for sure. I just wish you would have integrated more cervical anatomy. Though, in the end, you could be right. Sauropods might have been like but two species of birds… sampled in 1951… under who knows what conditions. Sauropods: reaching to fly…. but that damn neck. I will try to be brief. First of all, you will note (as clearly stated in the caption) that our Figure 4 is not a modification of Sereno et al. (2007: fig. 1G), but uses skulls modified from Sues et al. (2004), Gilmore (1925:pl. 16) and Hatcher (1901); you will also immediately comprehend that the point of that figure is to show the RANGE of head postures that could have been habitual if sauropod HSCC angles varied as much as do those of birds. The Duijm window describes a range not of head angles, but of habitual angles of HSCC inclination. Phylogenetic context on habitual HSCC angle is of course most closely reflected by sauropods’ nearest extant relatives the birds — the very group we alluded to in Duijm’s work. To the best of our knowledge, no similar survey has been published for crocodilians, otherwise we would have discussed that, too: if you know of one, please do tell. Finally, other exinct animals, such as ornithischians, can tell us NOTHING AT ALL about the angle at which HSCCs are habitually held. Only observations of the behaviour of extant animals can do that. Why integrate various sources of information to hone an argument? Perhaps because it doesn’t support your hypothesis. The essence of science is to *look* at the natural world, not just at published data. You know exactly what a study on crocodilians would tell us. If you don’t, you shouldn’t be doing this stuff. That you would suggest that extinct animals tell us “NOTHING AT ALL” here, tells me that you have an agenda and are selectively choosing data to support your argument (not that we all don’t do this to some degree). Why bother looking at fossils when the modern realm tells us all we need to know? Obviously, the tone has gone sour once we employ capital letters, so I’ll stop. OK, please explain how our direct observations of the remains of extinct animals such as ornithischians can give us information on how they habitually held their heads (without using information based on observations of extant animals such as birds). I genuinely don’t understand what you’re suggesting we should have done. you should have cited papers on the endocasts, which are indeed published. Well, we cited Sereno et al. (2008). As I said above, we weren’t trying to solve all the problems with sauropod heads and necks, just to point out that tetrapods don’t hold their heads and necks in ONP or their HSCCs horizontal all the time. instead of simply cribbing figures incorrectly (Which is fascinating that you precisely cribbed the entire Sereno figure and did not cite the paper in the caption!). We cite the paper and the figure in the text of the paper. I admit that we should have cited it in the caption as well since our figure is based on it. But I think accusing us of “cribbing” it is a bit harsh. Then we could see the angle of what the neck actually had to work with, which is still quite incorrect even as revised on Matt’s blog. You mentioned above that my new attempts are still five degrees off, since the skulls in Sereno et al. (2008:fig 1) already have their HSCCs angled up by that amount. Is this what you mean by “quite incorrect”, or are you referring to something else? Let’s try this one more time. Neither mammals nor birds habitually hold their heads with the HSCCs horizontal, but rather the habitual angle of the HSCCs varies quite a bit around horizontal, up to the 50 degrees documented by Duijm. All we’re doing is pointing out that currently we have no way of narrowing down that uncertainty for fossil taxa. If you know of some way to do that, please share. I can’t figure out what you think we’ve done wrong, but, again, I’d be grateful for clarification. You need to frame your question in a phylogenetic sense, optimize the cladogram based on osteological evidence, and then fill in the gaps. There are helpful people out there (that I know quite well) who I’m sure would have loved (and still would love) to share data to help resolve these questions. Again, I’m sorry, I don’t follow. Do these people have some new method that can narrow down the habitual HSCC angle for extinct animals that cannot be observed in life? If so, I’ve not heard of it, and you’ve not said how they’d do it, despite intimating repeatedly that we screwed up by not taking this other data into account. Please explain what that data is and how it can be used to narrow the Duijm window for extinct taxa. I think you’re both incorrect and deeply unfair here. How are we “saying what we please” that goes beyond our very unimaginative, plodding, literal application of modern ranges of variation to fossil taxa? And we’ve used the extreme range–all 50 degrees of variation documented by Duijm–literally at every step. The problem is that most vertebrates couldn’t take advantage of it. Again, most vertebrates would be in extreme pain, even given a low dosage of “Duijm Window” (and even the proper T-rex and Triceratops mounts, as pointed out on Matt’s blog would be hating life). It’s true that we can’t blow a dog whistle and see what many of these extinct animals were doing when startled… but since all basal theropods (immediate outgroup of Sauropodamorpha), have their heads horizontal when the HSCC’s are aligned to the horizontal, it’s a safe bet that they didn’t go all “Duijm Window” when startled. Most animals tend not to auto-induce whiplash. Thus, phylogenetically, the “Duijm Window” falls apart within Sauropsida, and if it did exist in Sauropodamorpha, it would be 100% apomorphic and untestable… and at odds with the evidence. What? Seriously, I cannot understand your argument. How does an animal “go all Duijm window”? The window is just the range of variation we see in extant animals, applied to extinct animals as a rough guess of how much we _don’t know_ about their posture. It’s an open admission of 50 degrees of ignorance, not something that any particular individual or species can “take advantage of” or induce whiplash with. Those two species (with the HSCCs held at 30 degrees above horizontal) are part of the range of variation that comprises what we call the Duijm window. Are you saying that they are somehow irrelevant to the problem, or that you or anyone else has data that shows that sauropods absolutely could not have held their heads (and necks) in that pose? Please understand that I’m not privileging that pose or any other within the 50-degree window; again, it is a measure of uncertainty rather than certainty. I hope you realize that screeds like this are not clarifying your case at all; quite the contrary. – that the Duijm window should not apply to sauropods–why not? – that there is evidence that would narrow the window that we ignored–what is it, and how does it narrow the window? – that we didn’t look at enough animals–surely looking at more animals could only potentially expand the range of variation, not narrow it? Hey, Ryan, thanks for that — no problem at all, and we appreciate your openness. If you’d like us to delete any of your comments, just let us know which ones. Apology accepted. Likewise, I’m sorry that in places my tone was less than friendly. You’ve probably reconstructed more endo-everything than anyone else alive, and I’m genuinely interested in your critiques. If you want to come back to this thread later, we’ll be (ahem) all ears. Thanks for changing the image; it had been bothering me since I saw it but I hadn’t had time to come back to it and check it up. Now I don’t have to, and that’s efficiency I can love! i just wanted a cool diagram for a tee shirt. but.. now ive learned something too. hooray!